Garden Montessori School's mission is to provide young children with a quality Montessori learning experience in order to promote their intellectual, physical and social-emotional growth; providing a solid foundation for future success. A young child meets the world around him through the constant use of all his senses. To examine a new object, a baby will look at it, hold it in his hands to feel the texture and weight, shake it, lick it, or even try to bite it. Since he quite naturally uses all his powers of observation during his early years, Dr. Montessori felt that this was the ideal time to give the child equipment, which would sharpen his senses and enable him to understand the many impressions he receives through them. The Sensorial Materials in the Montessori classroom help the child to become aware of details by offering him, at first, strongly contrasted sensations, such as red and blue, and then variously graded sensations, such as many different shades of blue. The material enables him to know what is red, what is blue, and then to understand the abstraction of blueness and finally the abstraction of color itself. Each of the Sensorial Materials isolates one defining quality such as color, weight, shape, texture, size, sound, smell, etc. The equipment emphasizes this one particular quality by elimination or minimizing other differences. Thus, the sound boxes are all the same size, same shape, same color, and same texture; they differ only in the sounds that are made when the child shakes them. The importance of education the senses can be illustrated by an example from the adult world. It is possible for adults, as well as children, to receive any amount of sensory impressions and be none the richer. Two men may attend a concert together. One experiences great pleasure and the other, with equally accurate hearing, feels only boredom and weariness. Sense impressions are not enough by themselves. The mind needs education and training to be able to discriminate and appreciate. A young child can remain unmoved by a myriad of sensory impressions in his everyday environment. What he needs is not more and more impressions but the ability to understand what he perceives. The Montessori Sensorial Materials help the child to distinguish, to categorize, and to relate new information to what he already knows. Dr. Montessori believed that this process is the beginning of conscious knowledge. It is brought about by the intelligence working in a concentrated way on the impressions given by the senses. Size in three dimensions is introduced to the child by the use of the Pink Tower. This is a series of ten pink cubes graded in size from on centimeter cubed to ten centimeters cubed. All the blocks are the same color, shape and texture. To perform the exercise the child must recognize the gradation in size and build the tower beginning with the largest cube and finally placing the smallest cube on top. The exercise is self-correcting because a block placed in the improper order will be immediately noticeable and may cause the tower to topple. The Brown Stair introduces the child to difference in size in two dimensions. This is a set of ten prisms with a constant length of twenty centimeters but whose width and height both vary from one centimeter to ten centimeters. Again, the child must place the blocks in proper gradation forming a stair-like structure. With this exercise the teacher introduces the concepts of thickness and thinness, using the terms thick, thicker, thickest and thin, thinner, thinnest, with the corresponding blocks as concrete examples. The Red Rods help the child to recognize differences in size in one dimension ? length. Again, the child must place the rods in the proper sequence from the smallest that is ten centimeters in length to the largest that is one meter in length. The exercise is similar to the preceding ones in that a mistake in the order is very evident to the child and can be corrected easily. It also offers the teacher the opportunity of introducing to the child the terms short, shorter, shortest and long, longer, longest. This equipment gives the child a sensorial basis for learning to count when he begins mathematics. The art of listening carefully is a quality worth cultivating for a lifetime. Many youngsters in today?s noisy world have formed the habit of ?turning off? their hearing. They make no effort to distinguish the many sounds that assault their ears and thus they block themselves from many learning activities. Listening attentively is a vital preparation for reading. Montessori designed several sensorial games to help the child concentrate on particular sounds. In one game a child is blindfolded and asked to identify particular sounds in the classroom, such as the noise of opening a window, closing a door, closing a book or pouring water. In another game, he tries to identify the voices of his classmates without looking at the students who are speaking. To help children become more aware of the intensity of sound, Montessori designed a set of six cylinder shaped brown wooden boxes with red tops. Each box contains a small amount of a different substance such as salt, rice, or dried beans. The sounds produced when the child shakes the boxes vary in intensity from soft to loud. This set of boxes corresponds to a second set with blue tops. Each box in the first set has a mate in the second set that produces a similar sound. The child must find the pairs by listening and the grade the boxes from the loudest to the softest. A child loves to touch. Much of the world comes to him through his hands as he investigates everything in his environment. He can use the sense of touch in a more meaningful way if he wears a blindfold. This eliminates visual recognition of an object and challenges him to recognize something with his fingers. In the Montessori classroom the child begins tactile activities with the Object Bag. This is a simple bag containing a collection of familiar objects such as a cup, lid, pin, string and ball. The child grasps each object and names it without looking at it. Further education of the tactile sense is accomplished when the child uses the Rough and Smooth Boards, which let him feel the difference between sandpaper and smooth wood. Next, he uses a set of sandpaper tablets that offer him eight pieces of sandpaper to be paired and then graded from the roughest to the smoothest. This activity is a preparation for the use of the Sandpaper Letters, to be described later. 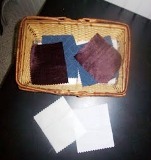 A parallel exercise for educating the tactile sense is a box containing many pairs of swatches of different materials such as wool, flannel, silk, cotton, velvet, canvas, lace, etc. In this exercise the child mixes all the swatches, puts on a blindfold and then identifies pairs by feeling them. The child can correct the exercise himself by removing the blindfold and looking to see if the pairs match. While doing this exercise the child also learns the correct names of the materials, thus giving him an opportunity to further extend his vocabulary during the years when he is especially sensitive to language development. Many of the sensorial exercises, by their very nature, are a remote preparation for academic learning. For example, the child who has learned to listen carefully will be able to perceive subtle differences in the sounds of the letters. Of equal importance to language skills are the geometric materials, which help the child to concentrate on different shapes. Since shape is the defining characteristic of each letter of the alphabet, Dr. Montessori designed several sensorial exercises to make the children aware of this quality. She began with the Geometric Solids. This is a set of materials alike in color and texture and of approximately the same size, but differing from each other in shape. The set includes the cube, the sphere, the cone, the cylinder, the pyramid, the rectangular prism and the triangular prism. The children learn to recognize these shapes by handling the solids, looking at them, and playing group games where they try to identify the shapes while wearing a blindfold. They also learn to relate the solids to common things in the environment; for example, the sphere is like a ball; the cylinder is like a drinking glass; the cone is like an ice cream cone. Vocabulary building is an important part of this activity. Children love a big word like ?supercalifragilistic? ; in the same way, they enjoy the challenge of big terms like cylinder, pyramid and rectangular prism. It is much easier for children to learn what a pyramid or a sphere is when they can hold it in their hands, than it is for them to learn it later in abstract form. When they study geometry in future years, children who have been in a Montessori class will have the necessary vocabulary based on concrete representations. The Geometric Cabinet presents the plane geometric shapes to the child. This cabinet contains six drawers of flat wooden insets representing different types of triangles, different sized rectangles, different polygons, different sized circles, irregular four-sided figures and various curved figures. Each inset has a little knob by which the child can move it in and out of its wooden frame. He does this at first like a puzzle. Later he matches the wooden insets to similar shapes on printed cards. The first set of cards has each shape printed in solid blue. The second set has the shape represented with a thick blue outline. The third set has each shape drawn with a pencil-thin blue outline. As the child matches the wooden insets to these three sets of cards, he gradually makes the transition from a shape in solid form to a shape outlined with a pencil. This is a remote preparation for recognizing the different shapes of written letters and numerals. The Constructive Triangles are brightly colored flat triangles that the child puts together like a puzzle. Each triangle has one or more edges bounded with a black line. By matching the black lines, the child is able to construct many of the straight-edged geometric figures. The completed figures illustrate how these shapes are actually composed of triangles. 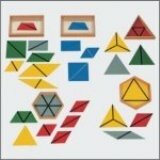 The picture shows a variety of geometric figures made up of two triangles. The triangle itself has an interesting composition. In the picture it is shown as composed of two triangles, three triangles, and four triangles. Indirect preparation for the motor technique of writing begins when the child uses the Cylinder Blocks. These are four oblong blocks of natural colored wood. Each block contains ten cylinder shaped insets that can be handled by a knob attached to the top. The cylinders vary in graduated differences of depth and diameter. At first the child works with one cylinder block. He takes all the cylinders out, mixes them up, and replaces each in its corresponding socket. The exercise has a built-in control of error because each cylinder fits correctly in only one particular hole. Later, he works with two, three, and finally four blocks at the same time. Eventually, a child can perform the whole exercise while wearing a blindfold. Essentially this is a sensorial exercise in discrimination of size. However, it is also an important muscular activity because the child grasps the little knobs with the same three fingers that he will later use to hold a pencil. Each time he does the exercise, he gains control of the small finger muscles that he will use eventually for writing. Other materials in the classroom, which require the handling of this same type of knob, are the insets in the Geometric Cabinet and the pieces in the Puzzle Maps. To be able to write, a child must develop a two-fold skill. He must commit to memory the shape of the letters and their corresponding sounds, and he must develop the muscular skill necessary for using the pencil with control. To clarify this distinction, look carefully at what happens when either phase of this skill is not perfected. A child may wish to write dog. He has good control of his hand, but his intellectual knowledge of the letters is hazy. He writes bog very neatly. On the other hand, a child may know all the letters perfectly, but his hand is not practiced. He wants to write dog but he actually puts clog on the paper. For a child to try to acquire both aspects of this skill at the same time is often discouraging and frustrating. It is extremely difficult for him to try to learn the path for making the letters at the same time that he is trying to learn how to move the pencil with control. The materials that Dr. Montessori designed offer the child the opportunity to learn the shapes and sounds of the letters in a way that is completely independent from his perfection of the motor skill. The child, therefore, in the Montessori classroom learns to write not by writing, but by performing a number of purposefully structured activities that prepare him both indirectly and directly for facility in handwriting. The child meets the alphabetical symbols by using the Sandpaper Letters. Each letter of the alphabet is outlined in sandpaper on an individual card, the vowels on blue and the consonants on red. The teacher shows the child how to trace the letter with two fingers following the same direction in which the symbol is normally written. Use of this material gives the child a three-fold impression ? he sees the shape, he feels the shape, and he hears the sound of the letter that the teacher repeats when introducing it. The fact that the letter is made of sandpaper, rather than ink, invites the child to trace the shape. This is an important step in learning to write. The repetition of this exercise fixes the path of each of the letters in the child?s muscular memory. In a Montessori classroom the child learns the phonetic sounds of the letters before he learns the alphabetical names in sequence. The phonetic sounds are given first because these are the sounds he hears in words. For example, a child can hear t at the beginning of the word top. He cannot hear the alphabetical sound tee. The child first becomes aware of these phonetic sounds when the teacher introduces the consonants with the Sandpaper Letters. For example, when presenting the letter m, the teacher makes a humming sound rather than saying em. She suggests words like Mommy or muffin that begin with this sound. The child then repeats the sound and usually mentions additional words in which this sound is used, like man or mine. In the first introduction of the vowels, the teacher gives the short vowel sounds such as those at the beginning of the word, apple, egg, inset, ostrich, and umbrella. 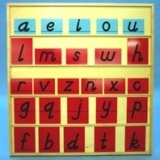 As soon as the child learns a few vowels and consonants, he is ready to begin constructing three letter words that have a short vowel sound with the Moveable Alphabet. The child in a Montessori classroom learns to control a pencil by filling in outlines ? an activity that does not weary him because he enjoys it. To make the outline, he uses equipment known as the Metal Insets. Each inset represents a different geometric shape. After selecting a figure and tracing it on paper, the child fills in the outline with a colored pencil of his own choosing. At first his strokes are erratic and often extend beyond the outline. By degrees they become more accurate and uniform. Progress in muscular control can be noted by comparing the child?s designs from week to week and from year to year. Eventually he makes more intricate designs by superimposing two or three other shapes on the original figure. When colored, this effort resembles a stained glass window. Although work with the Metal Insets gives the child an opportunity to experiment with color and design, it is not considered creative art. Crayons and paints are not used for this activity because the purpose is always pencil control. Sometime during the years when a child is in a Montessori class, an exciting thing happens. After he has worked for a while with the Metal Insets and the Sandpaper Letters, a day comes when he realizes that he is able to make words with a pencil. Montessori called the phenomena the ?explosion into writing.? When writing begins in this spontaneous way, the child is spared many tedious hours of forced effort. Writing is fun. Because he has already learned control, the repetition necessary for developing neatness and style does not tire him.